As noted previously, I’m relatively new to bourbon. So, I’ve been making it a point to try a number of the “staples,” or the readily available, inexpensive bottles. One thing I’ve found with bourbon is you don’t need to go too deep into your wallet to find quality whiskey. The Elijah Craig 12 year was promising. It’s a well-aged whiskey from a reputable distillery. I figured I could not go wrong. However, this bottle left those promises unfulfilled (and perhaps my expectations were too high). 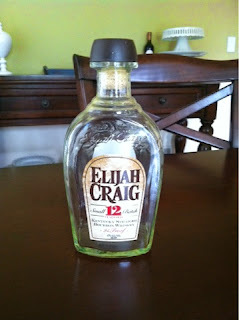 It did not provide any stand-out flavors, with everything kind of blending together in one, average bourbon. The only thing that really set it apart from any other bourbon was its spiciness, but even that wasn’t strong enough to really give it character. The oak flavor does stand out, giving the whiskey a woody and earthy flavor. Unfortunately, it seemed to mask the sweetness of the bourbon. At 94 proof, although it’s not a high alcohol content, the burn still came through and lingered longer than I expected it to. I deliberately held off on drinking this for about a week after opening, hoping that the oxygen might tame the burn and enhance some of the flavors that were just too subtle for me to notice in my first pour. Unfortunately, this was an instance where the bourbon remained consistent from the first pour to the last.